From Hancock County courthouse, go 0.1 mile east on Broad St. to Boland St. (2nd traffic signal). Turn right on Boland St.,which becomes Linton Rd, and go 11.4 miles to the intersection with Hitchcock Cemetery Road, which comes in from the right. Continue on Linton Road for another 0.6 mile. Turn right on a dirt road. Go 1.0 mile. Turn left onto a woods road. Go 0.1 mile. 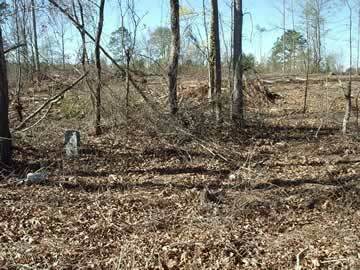 The cemetery is on the left side about 100 yards from the road. Family records and DAR records of the 1930's suggest that the name of this cemetery is the Gause Cemetery, a family which was associated with this cemetery after the Miller family. Therefore we have named it the Miller-Gause Cemetery. d. before Jan. 19, 1804. d. Hancock Co. See attached writeup for sources. Local DAR records say "He could speak the Creek Indian language". writeup for more info regarding service. w/o Jonathan Miller. No marker exists, but she is probably buried in this cemetery. Approximately 15 depressions, aligned in 2-3 rows.